Have you ever thought about improving the presence of your business by getting a windows application development? Windows application can give you a whole lot of visibility as many people who use devices such as desktops, laptops and windows phones will be able to download and access your app. Such an app will not only increase your sales but also provide you with a platform to be in touch with your customers at all times. This way, you will be able to increase the brand loyalty of your customers and build strong relationships with them. Samaritan InfoTech has great experience in mobile app development on numerous mobile platforms. We offer end-to-end solutions for windows app development to help our customers need to the largest user base possible. 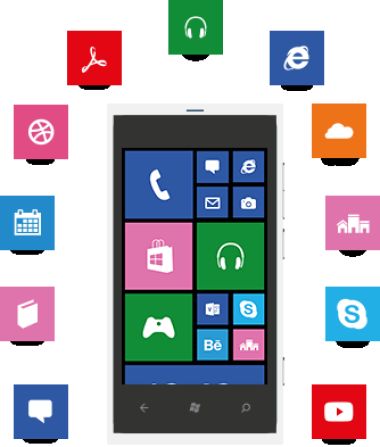 Samaritan InfoTech is one of the best windows phone apps development company in India. We have well knowledgeable professionals who have all the skill required to develop a windows applications. We use all latest and updated tools and technologies to include as many features in-app that we develop. Before starting we first go through your competitors apps and then see how we can do better than those apps that are user friendly and stands out in crowd as a leaders. Our app developers are also well qualified in porting windows apps to other platforms. We develop user-friendly, descriptive and fun apps for Windows devices. Our Windows Phone Application Development team is well acquainted with Windows mobile SDK, Visual Studio, .NET compact framework, SQL Server mobile edition in both native and managed programming languages. An Android app is a software application moving on an android platform. An Android platform is built for mobile devices. It gives you a first class platform for Android users. Android applications are written in the Java Programming Language & use java core libraries. Java is a basic building block and backbone for Android Application Development that allows developers to program complete application on Java that runs on Android Mobile. We develop high-quality android apps for mobile phones & tablets. We have a creative team to modify your vision into super sleek, attractive & useful android app. FOS being the products of a pioneering company Apple, it has created a meaningful high-end market share. Though iOS devices come with standard screen sizes, has been a superior brand it brings its own requirements of Consumer experiences because of its niche focus and user biases. We help you design the strategy you want for your mobile application. Our programmers strive hard to understand both the technical & business side of your app to create something innovative, creative & usable. Our application developers strategize policies & procedures to achieve high-quality services. Windows App is a software program written to run under the Microsoft Windows operating system. Our techies can create and deliver high-end windows mobile applications. Our company has an extensive knowledge in developing all types of windows app like Windows store Applications, Windows Phone Store Apps, Universal Windows App. Samaritan InfoTech team offer high potential growth because there are not many apps available currently. We create new apps compatible with different windows platform & OS. SamaritanInfoTech is following 3 steps to develop & give top most designed to our end users. The development of a Windows mobile app starts with our business analysts discovering and defining your requirements for the final product. During this phase we identify potential risks and technical challenges, prioritize a set of required features, and build a project roadmap. We create wireframes and prototypes of the future app to ensure excellent user experience, easy feature navigation, and intuitive functional capabilities. As soon as the conceptual phase is over, Velvetech’s engineers dive into programming the application. The used in the development process Agile methodology allows building products in several iterations, adding new features and improving performance during every next sprint. This practice is one of the most preferred among clients, as it guarantees transparency in work, quick delivery, and predictable costs. Whether the users of your future Windows app prefer smartphones or tablets, we will ensure that our solution runs smoothly on all devices under any conditions. Each stage of the development process, our QA engineers will be occupied with testing your mobile application. Detecting and eliminating the design drawbacks and failures in the program code, we deliver products that generate higher user satisfaction.